HS Industrial Art (Art /Design);Hunter Col; Cooper Union,1960, Columbia U.,1962; Pratt Graphics Art Ctr.1981: Solo Shows: Jeffrey Leder Gallery, LIC, 2012; Southeast Missouri State Univ. 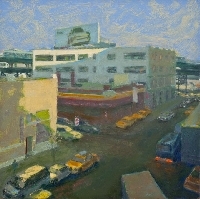 Museum, 2002; Nat'l. 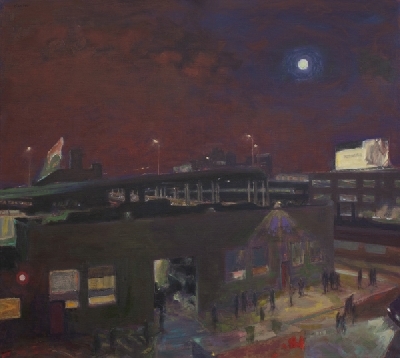 Arts Club, Trask Gallery, 1999; NY Vista, WTC, NY 1991; Suffolk County Com. Col., Peconic Gallery,NY, 1986; Group shows: Arcilesi/Homberg Gallery, NY, 2011-2016; Nat'l Academy Museum, NYC 185th Annual, 2010; Lori Bookstein Fine Art, NYC, 2008; NY Studio School,Benefit Auction 2007,05; The Painting Ctr., NYC, 2007; ACA Galleries, 2006; Butler Inst.Amer.Art, OH. 2005,2001,1998;David Findlay Jr.Fine Art,NYC, 2003; Marymount Col./Fordham U.,NY,2003; Maryland Federation Art 2000,1999,98,97, Museum City of NY,1997; Staten Island Inst Arts,Biennial, 1997;Owen Gallery,NYC,1995;Salander- O'Reilly Galleries/Fred Hoffman,CA,1993;etc. Numerous reviews/ articles, catalogs, books, public collections; Richard Florsheim Art Fund Grant, 2002. 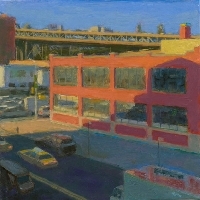 In 2002, after more than 20 years painting at Union Square,NYC, I moved my studio to Long Island City. Here, I look out on the highways connecting to the Queensboro Bridge, the El trains, smokestacks, the Silvercup sign, a red school building with a brightly lit yard all under a big sky. I have drawn this into my paintings. When I can find a certain kind of light, I try to describe it through color. Formative years of abstract painting still infuse my personal, visual language. As the paintings tend to evolve slowly, sometimes over years, resolution will rely upon memory. Memory then drives the painting. Memory becomes the subject as earlier works done from nature are now guiding me into landscape.